Are you looking for the perfect way to spend 10 days in Japan? Here are my top tips for how to get the best out of the country in a perfect 10-day Japan itinerary. 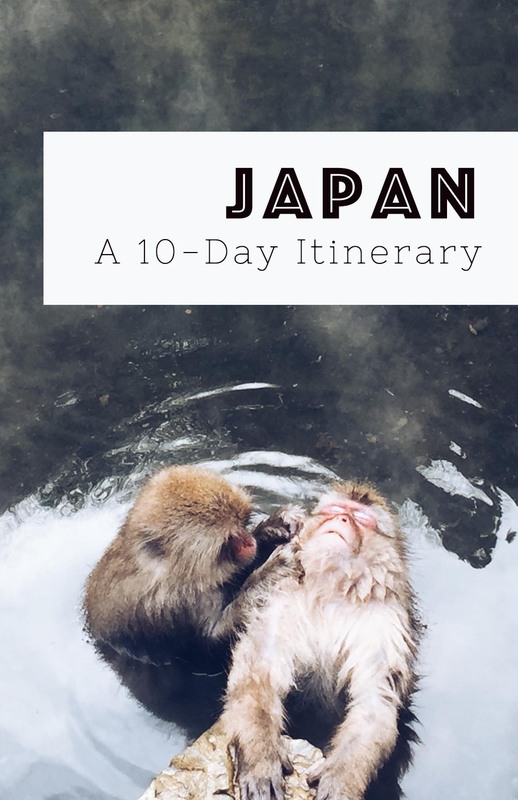 Ten days in Japan is enough for a first timer, but you could easily stretch this itinerary to two weeks in Japan if you have a few extra days, or skip one or two places if you only have a week there. Mad, mind-boggling, and futuristic are all words that come to mind when I think of our 10-day trip to Japan. From the Zen of the temples to the crazed sounds of a pachinko parlour, Japan is king of extremes. It topped our wish list for years, but we were always put off by the expense. We kept saving it for “a time when we had money”. But then we were invited to a wedding in Seoul, and after finding out it’d only cost £80 to add a stop in Japan, we decided the time was finally right. 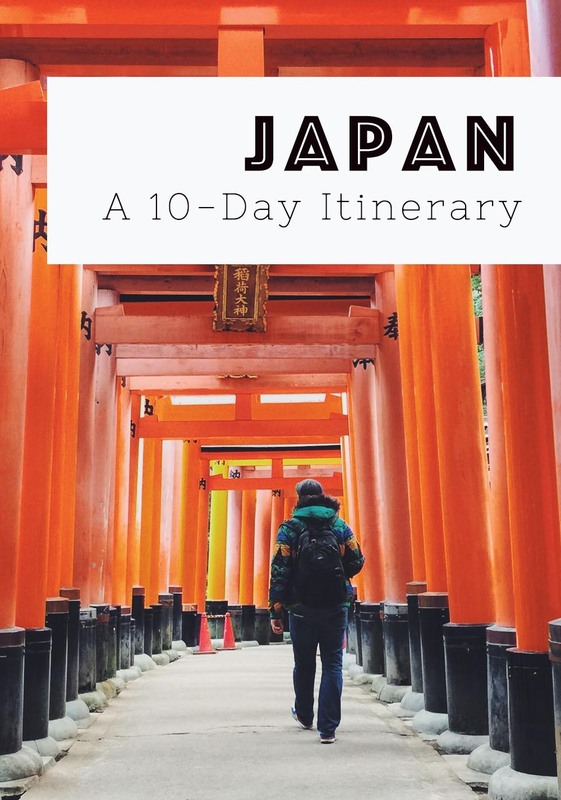 We wouldn’t be able to stay long, but ten days would be enough to give us a taste of Japan and finally see the country so many people rave about. We spent a lot of time researching our trip to Japan and planning the perfect 10-day Japan itinerary, so this Japan travel blog is here to help you save time when creating your own Japan trip. I hope you find it useful, and do feel free to add your own Japan tips and questions in the comments. As readers of this blog know, we normally adopt a ‘slow travel’ approach, spending days or even months in one place, but with Japan it was different. It had topped our wish list for years, but we were always put off by the expense. We kept saving it for “a time when we had money”. So, when we were invited to a wedding in Seoul, and found out it’d only cost £80 to add a stop in Japan, we decided the time was finally right. We had a limited amount of time and money, so we wanted to try and fit in as much as possible into the ten days in Japan. This meant there were moments where it felt rushed compared to what we’re used to, but looking back, I wouldn’t change it as those moments of busyness were worth it for the things we saw. We also managed to fit in many moments of calm, which helped to balance the fast-paced travel. Of course, it would have been nice to stretch the trip and spend a few days in each place to soak everything in some more, but for the time and money we had, our Japan itinerary worked really well. Depending on your priorities, you might like to skip some things and add extra time to some of the others, but if you’re looking for a good introduction to Japan then I recommend our trip wholeheartedly. We’ve also written a storybook version of the Japan itinerary with lots of photos to inspire you. And beside this Japan blog, also have a look at our travel resources page for lots more money- and time-saving tips. Is Japan as expensive as people say? Regarding price, Japan wasn’t as expensive as we had imagined. It’s very pricy in comparison to south-east Asia, but the costs were comparable to London. For example, you could get a coffee for about £2.50, and an average dinner at a mid-range restaurant cost around £30 for two people without alcohol. At lunchtime, we spent as little as £6 each for a curry. Our accommodation cost from £60-£150 per night for two people, sometimes including breakfast and dinner. This was on a moderate budget where we sometimes splashed out but other times stayed in a hostel or AirBnB (by the way, if you sign up with this link you’ll get £25 off your first booking). We never went full luxury as the prices were sky-high. Details of all the places we stayed are included in the Japan itinerary below. You can also use this discount code to get £20 off your first booking with Booking.com. How much does a 10-day trip to Japan cost? To replicate our 10 day Japan trip, excluding flights, would cost around £2400 for two people. That’s around £900 for the accommodation; £500 for travel; and a budget of £100 per day for food and activities. 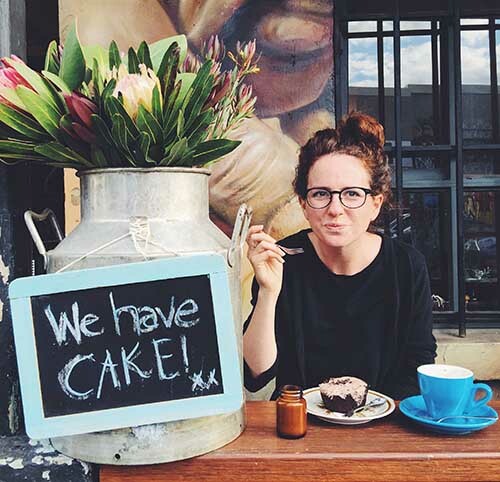 You could save money by doing some self-catering or sticking to cheaper restaurants. How is Japan for vegetarians? One of the most common questions we get is: Is Japan good for vegetarians?, and the answer is kind of. We ate really well in Japan, and with a bit of effort were able to find great Japanese vegetarian options, but there were also times when we struggled. Those times were the evenings when we decided to simply walk around a city and choose somewhere without any research. Unfortunately, I don’t like nori, which means our options were limited even further. On one of those nights, we ended up eating pizza and the other night, we finally found an okonomayaki only to find that the chef had covered it in fish flakes (this was despite us seeing him start to do this and reminding him we didn’t eat fish. He was adamant that fish flakes didn’t count!). I would recommend doing a little bit of research before you set out each day so you know where to find the good veggie food. 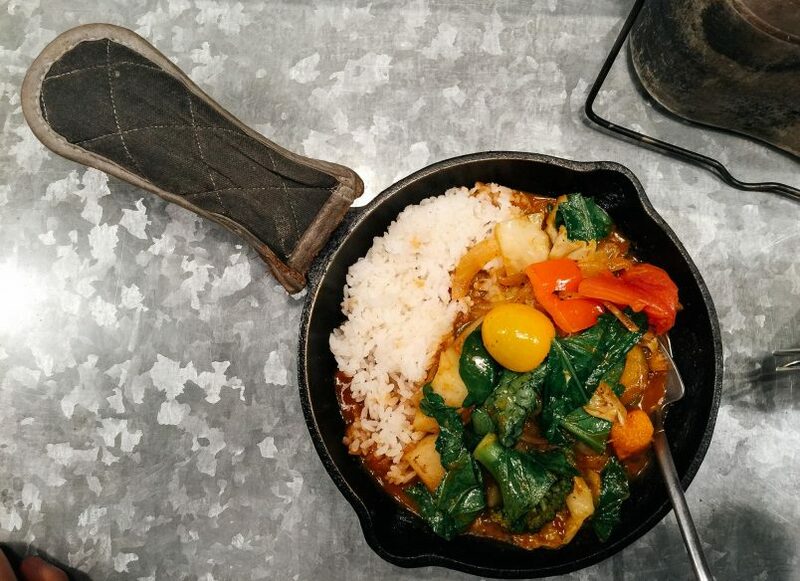 All of the restaurants recommended in this itinerary are vegetarian-friendly. We’ve added transport and accommodation info to each section of the itinerary. The days overlap for each place as we often spent the morning in one place before travelling on to the next. One top tip if you’re traveling long distances is to get a Japan Rail Pass (a JR Pass). You have to order this before you enter Japan (there is no leeway on this) – they send you a ticket called an ‘exchange order’, which you then exchange for the pass once you’re in Japan. To work out if getting a pass is worth it, you can estimate out how many train journeys you’ll be taking and add up the prices using Hyperdia, which is a really useful Japanese website detailing all the transport timetables. We only saved about £40 by getting a rail pass, but some people save a lot more when they cover longer distances than we did. Another benefit of having a rail pass is that you don’t have to buy tickets for each individual train – you simply show your pass at the gate. It’s important to note that the pass isn’t accepted on every single train in Japan – for example we couldn’t use it for the Hakone loop or for some of the private local train lines within Kyoto. There’s an option on Hyperdia where you can search for trains that are only included with the JR Pass. The passes are available for 7, 14 or 21 days and you can get an ordinary pass or a green pass, which allows first-class travel. We went for the ordinary one, which cost ¥38,880 (£230) for seven days. We now know you can get a pass for less money by booking through this website; for example our pass costs around £201 with them. Also remember to accurately time the day you activate your JR Pass so that you can make the most of it. Because we had a 10-day trip and only a 7-day pass, we activated it on day 4. This worked well as our first three days were in Tokyo where we could buy a subway ticket instead. Buy your JR Pass here. When travelling, I tend to use my Three Mobile Go Roam package, but as Japan isn’t a Go Roam destination, we instead relied on mobile wifi devices and a travel SIM card while there. These let you make phone calls and use the internet on your phone at local prices rather than incurring hefty roaming charges. You can choose one or the other, depending on what works best for you. Lots of the AirBnBs we stayed at supplied mobile wifi devices, but it’s a good idea to buy/hire one yourself as then you’ll have access to the internet wherever you go/stay. One recommended company is Sakura Mobile. It offers easy-to-use travel SIM cards and pocket wifi devices, which are preconfigured to work with any given country’s phones or computers (lots of local Japanese SIM cards do not work on foreign devices). Choose the option that suits you best and order the card/device online. You can pick them up at the airport/the company’s office in Shinjuku or have them delivered to your hotel. Handily, the company offers full English language support. Order at least three days before your arrival. Order your SIM Card here. Order your pocket wifi here. Tokyo is one of the most fascinating cities we’ve ever been to and the kind of place you could spend a lifetime getting to know. We had three nights there so tried to pack in as many Tokyo experiences as possible into that time. We stayed in Shibuya, which was an ideal place from which to explore the city. It’s one of Tokyo’s most iconic areas of the city and is filled with bars, malls, restaurants, karaoke bars, and a hell of a lot of neon. 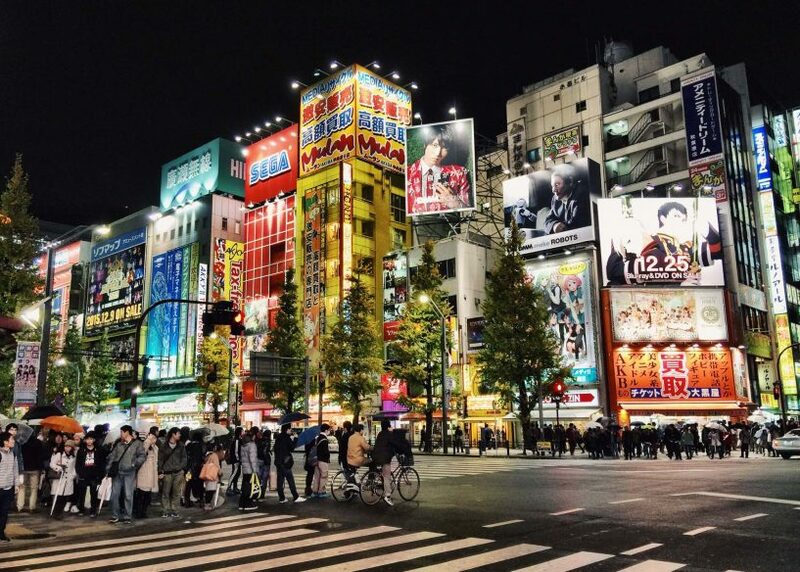 It’s also home to the world’s busiest intersection, which tells you a bit about how buzzing Shibuya can be. We also explored Akihabara, which is the centre of the city’s otaku culture and home to lots of amusement arcades and cheap tech shops. This is also where you go if you want to experience a maid café, which we decided was a step too odd for us and likely to enrage my feminist instincts. Other areas we explored were the shopping district of Ginza (where we bought A LOT of stationery in Itoya); Jimbocho, which is home to streets of bookstores; the beautiful YoYogi Park in Harajuku; Shinjuku, the crazy entertainment district where we went to the Robot Café (which did somewhat enrage said feminist instincts); Golden Gai, which is an area with rows of tiny little bars, perfect for an evening drink; and Ebisu, an upmarket hipster area with lots of lovely boutiques and restaurants. We tried to go to the Shinjuku Gyoen National Garden, which looked beautiful but was closed when we went there on a Monday. If you’re into fish, there’s the Tsukiji Fish Market, the largest fish market in the world (you could combine it with a sushi class on this tour). And if you go during cherry blossom season, try Ueno Park and Sumida Park, which are both gorgeous cherry blossom spots in Tokyo (or you could join a tour of the blossom guided by a local enthusiast). We stayed in an AirBnB apartment in Shibuya. The exact one we stayed in is no longer available, but there are plenty more like it – tiny but clean apartments, less than 5-minutes from Shibuya station. Ours cost ¥8,600 (£51) per night, and included a mobile wi-fi device, which was very useful (this seems quite standard in Japanese AirBnBs). Remember to sign up to AirBnB with this link to get £25 off your first booking. We ate really well in Tokyo and it was easy as vegetarians. One top tip if you’re looking for a budget eat is to look for one of the many curry shops, which nearly always have a vegetarian option. We tried one in Shinjuku (モンスナック) and another in Jimbocho (Bondi) – both were delicious. Other highlights were a tofu restaurant in Shibuya called Tofu Ryori Sorano (where they made fresh tofu at your table); 板蕎麦 香り家, a soba restaurant in Ebisu; traditional vegetarian temple cuisine at Komaki Shokudo, a little restaurant in a Whole Foods style market called Chabara. We also spent one evening in an izakaya, which is a traditional Japanese bar serving tapas-style dishes – there are tons of these in Shibuya. I’ve also heard good things about: Bon, a veggie restaurant, specialising in fucha ryori, a version of shojin ryori (veggie buddhist cuisine); T’s Tantan, a vegan ramen restaurant in Tokyo station; veggie restaurant Milk Land near Shinjuku Station; tempura at Tsunahachi; and okonomiyaki at Zen. For drinks, one evening we went to the Mandarin Oriental. It’s pricey but worth if for the incredible view across the city. And we also did karaoke in Shibuya, which was surprisingly brilliant (you pay per hour for a booth and the menu is in English as well as Japanese). A top coffee recommendation is Café de l’Ambre in Ginza, which is a charming traditional coffee shop with the tiniest milk jug you ever did see! A good way to experience Japanese cuisine in Tokyo would be to join a food tour like this half-day local food tour, or this 3-hour tour through the fish market. . Or take a cooking class, such as learning to cook tempura or doing a private cooking class in a local home. We bought a prepaid IC card to get around Tokyo – these are available in the subway stations and you simply add credit like you do with an Oyster card in London. There are two types, Pasmo or Sucia, and we used the Suica one. They are valid on both the subway and JR lines. However, if you’re travelling a lot in one day, it might be cheaper to get a one-day pass, which start at about ¥600. The problem with these is that they’re only valid on certain lines. There’s a lot of useful info about this in this post. We didn’t use our JR pass because we activated it on day 4 when we started taking longer train journeys. Our prime motivation for going to Hakone was to catch a glimpse of Mount Fuji – a definite Japan highlight. 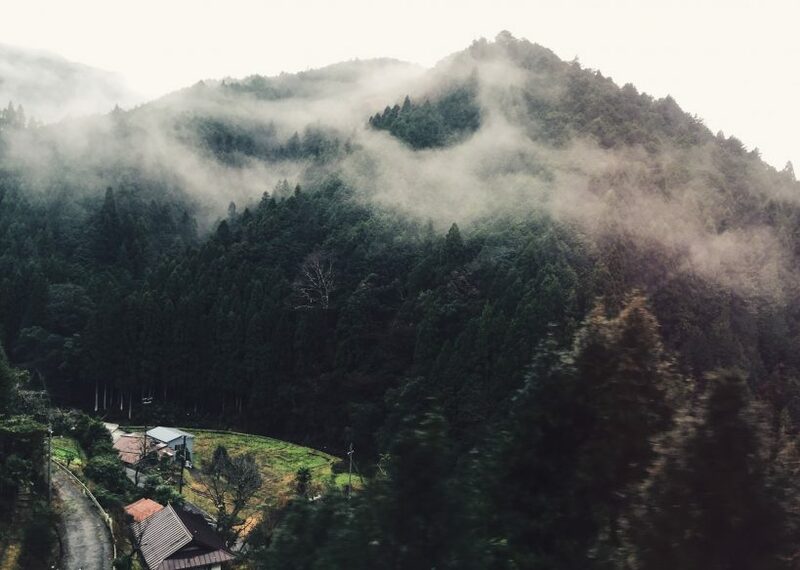 It was a gamble as the mountain spends a lot of time hidden behind clouds, but we were willing to risk it, plus we also liked the idea of spending some time in Japan’s countryside. It was definitely worth it as we did get to see Mount Fuji, which was a truly spectacular sight, and even without that, I think the trip would have been worth it for the magnificence of all the scenery and the peaceful break away from the city. We did the Hakone Loop (see transport section below) and mostly concentrated on enjoying the gorgeous sights. 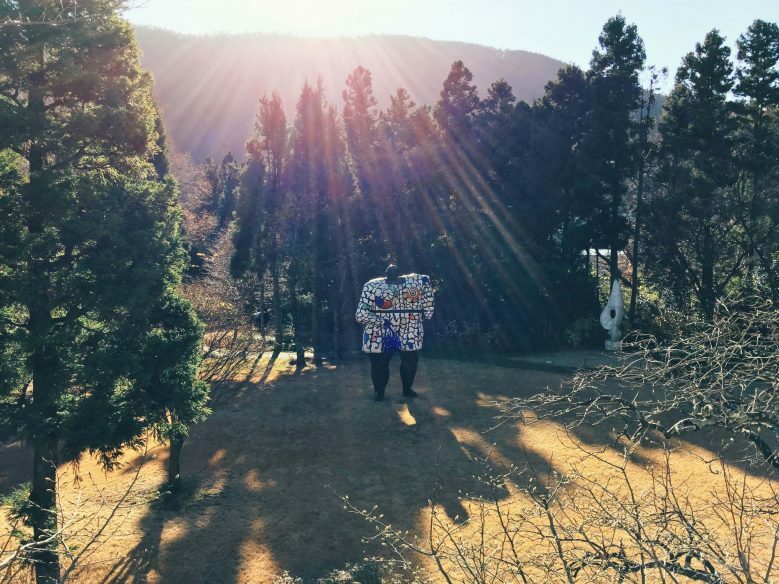 We also went to the Hakone Open Air Museum, which is a world-class sculpture park and gallery featuring works by artists such as Picasso and Henry Moore. Sadly, the sculpture I wanted to see the most ­– the Forest of Net– was closed due to safety problems, but the other sculptures made up for that. If we’d had more time, I’d have liked to go to the Museum of The Little Prince too. Our hotel stay in Hakone was also a highlight (see below). You could go to Hakone as a day trip from Tokyo on a tour like this one that is a nine-hour round trip. Or if you want to include a bullet train too, you could do this one instead. We stayed at a ryokan called Mount View Hakone, which was our first ryokan experience. 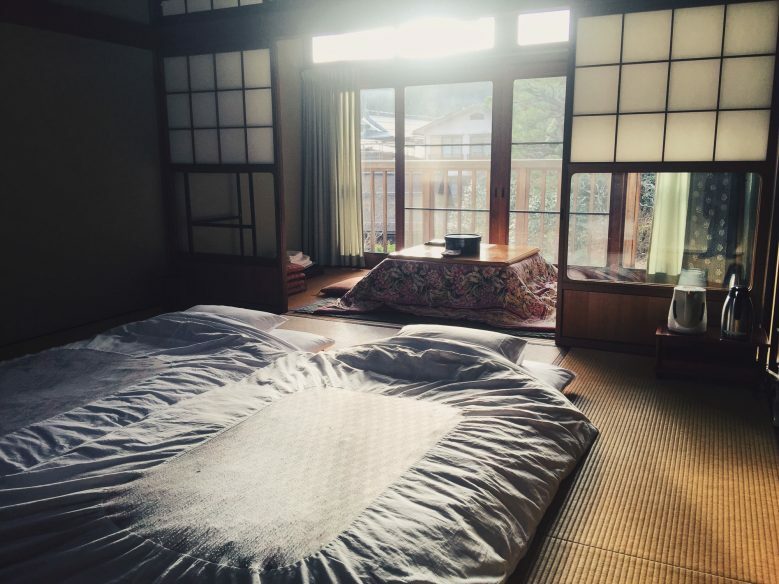 Our room was exactly as I imagined a ryokan to be – peaceful, sparse and calming. As with all ryokans, there were public onsens available for guests (one for men and one for women), but one of the highlights of Mount View Hakone was the private onsen that you could hire for 45 minutes for 2,000 yen. This meant that Steve and I could go in there together. The onsen was outside and looked out onto a beautiful bamboo forest, illuminated by green light. For me, being in warm water in a cold climate is one of the most refreshing experiences I can think of – it took me back to the saunas of Finland. Another highlight at Mount View Hakone was the food. It was our first multi-dish Japanese meal and we loved the adventure of it, especially safe in the knowledge that everything was vegetarian. The food was an eclectic mixture of Japanese and Western food, including ramen, potato wedges, and vegetables that we grilled ourselves at the table. It sounds odd, but it worked! Meals are served in a large dining room along with the other guests. The hotel is right next to the Little Prince Museum. Rooms cost from £100 per night, which includes breakfast and dinner. Use this discount code to get £20 off your first booking. The main food we ate in Hakone was at the ryokan, but on day one, we had lunch at a little restaurant near the pirate boat stop. The vegetarian choice was slim but we ate some tempura and soba noodles. There is also a really cute coffee shop inside an airstream caravan at the top of the ropeway. We enjoyed some delicious hot chocolate and a cake up there. Hakone is a popular day/weekend trip from Tokyo and it only takes about an hour to get there on the shinkansen bullet train. The classic thing to do there is the ‘Hakone Loop’, a journey around the area that takes you on five types of transport: bus, train, pirate boat(! ), ropeway and cable car. If you leave early enough, you can do the whole loop in a daytrip from Tokyo, but we split the journey into two days. You buy a pass called the Hakone Free Pass, which allows you to go on all the different transports in the loop over 2 or 3 days, depending which one you buy. The 2-day pass costs ¥4000, or ¥5,140 including the train from Shinjuku. Our hotel was about ¾ of the way around the loop so we went in an anti-clockwise direction and did the first ¾ on day one, and the remaining quarter the next morning. This worked well as it meant we could be finished in Hakone by about 11am and make the most of our next destination. However, our journey around Hakone was definitely the most rushed part of our Japan trip and I wish we could have added an extra day or at least a few more hours. One key thing to bear in mind is that the ropeway sometimes closes early. On the day we went, it closed at about 3pm, just as we arrived. They wouldn’t let us on, which meant we missed that part of the trip and had to take a bus up the mountain instead. This was a big disappointment as it’s from the ropeway that you get the best views of Mount Fuji. Had we known this before, we would simply have left Tokyo earlier in the morning. Don’t make the same mistake! Shibu Onsen was not a convenient stop on our Japan itinerary, and it would have made much more sense to go straight to Kyoto on the high-speed shinkansen from Tokyo, but we were fixated on going there so we decided to make it work. The main motivation for our trip there was to see the snow monkeys, which were made famous in the movie, Baraka. 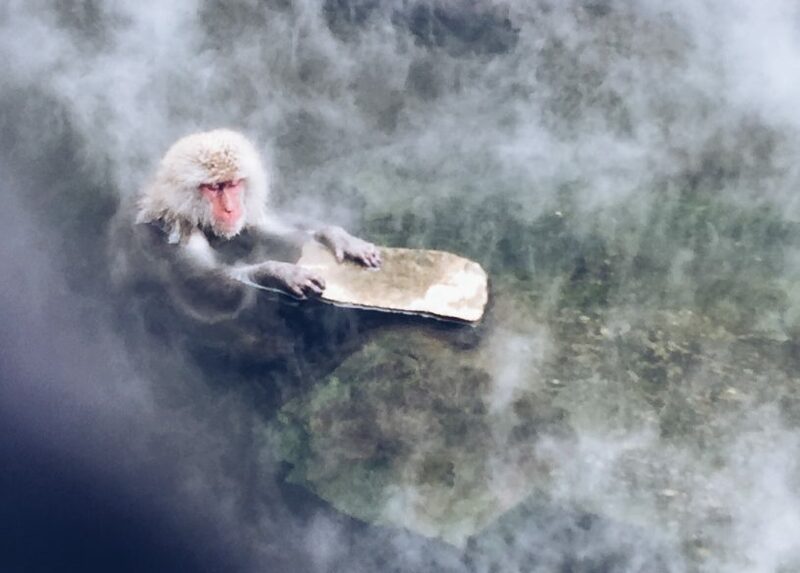 These monkeys have overtaken an outdoor onsen in the mountains of Nagano and spend their days taking respite from the cold and bathing in the warm water while grooming each other. It’s like a little monkey spa. Despite our past run-ins with monkeys, we were desperate to see these creatures for ourselves and, for us, it was worth it. The monkeys were much more peaceful than the ones we encountered in Bali (I think because people weren’t feeding them) and it was fascinating seeing how human-like their behaviour was in the onsen. One thing to bear in mind is that the setting of the monkey spa isn’t as idyllic as it looks in some photos. The immediate surrounding area of the pools the monkeys bathe in is quite dishevelled and resembles a building site, but the 30-minute walk to the snow monkey area is beautiful, through a deep pine forest. I had heard that the walk can be treacherous, but it felt very safe to me (and I am terrified of heights and cliffs). That said, it was only snowing lightly when we went, and in icy conditions, the path would probably be dangerous as, despite being wide, it does have a big drop on one side. And it is, of course, very touristy, so don’t expect to be the only ones there! All that said, we still enjoyed it and were pleased we made the trip. Aside from the snow monkey park, our trip to the region was also made worth it for our time in Shibu Onsen, a little spa-town, about 15 minutes away from the snow monkey park. There are nine onsens in the town and it’s said to bring good luck if you visit every one. Only one of the onsens is open to the public, but you are given a key to the other eight if you stay in one of the ryokans in Shibu Onsen, which we did. Steve and I had an amazing evening, walking around the town in the snow, dressed in our robes and wooden clogs, visiting all of the nine onsens. They are split into male and female rooms and we both encountered plenty of villagers taking their evening bath and giggling at us as we struggled with the high temperatures of the baths. Each onsen has a stamp that you can print on a towel provided by your ryokan. Traditionally, you’re supposed to offer this towel to the temple in Shibu Onsen, but we couldn’t resist keeping ours as a souvenir! If you don’t want to stay in Shibu Onsen, you could do a day trip to the snow monkeys from Nagano station. Get Your Guide offer this one that also includes a visit to a temple; this one that runs in winter and also includes a visit to the snow fields; and this one that takes you to see the blossom during cherry blossom season. We stayed in a traditional ryokan in Shibu Onsen called Sakaeya. We opted for one of the newer rooms, which came with a kotatsu, which is essentially a table with a blanket table cloth and a heater underneath – it’s wonderfully cosy and perfect for the cold weather. We also had a balcony that looked out over the town. Food at Sakaeya was served in a private dining room, just for Steve and I, which felt extra special. The food here was of a higher quality than at Mount View Hakone and entirely Japanese. We tried a lot of things we’d never seen before and loved the variety of flavours. We told the hotel we were vegetarian beforehand, and they were happy to accommodate us. The only thing we couldn’t stomach was a raw egg that came with our breakfast! We only ate at our hotel but there are a few little restaurants in Shibu Onsen too. As we said before, Shibu Onsen was an out-of-the-way stop on our trip in Japan. To get there from Hakone, we had to take a train back to Tokyo from Odawara station (80 minutes); a shinkansen from Tokyo to Nagano (100 minutes); a train from Nagano to Yudanka (50 minutes); and a bus from Yudanka to Shibu Onsen (10 minutes). It took about four hours in total. If Tokyo is Japan’s futuristic centre then Kyoto is its ancient heart. The city is filled with thousands of temples, shrines and gardens and , if you’re lucky, you’ll see some geisha walking to their secret rendezvous through the atmospheric cobbled streets. We only had two nights there and one full-day so we had to heavily prioritise what we wanted to see. You could easily spend weeks in Kyoto, exploring all the sights, and it’s a must for any Japan itinerary. The things we chose to see were: Kinkaku-ji, also known as the Golden Pavillion; Kiyomizu-dera, a temple with a balcony that overlooks the city and is the perfect place for sunset; and Fushimi Inari Shrine, a place you’ve likely seen photos of with its iconic paths lined with red tori gates. To save time and for some added information, you can see all of these and more on this private guided tour of Kyoto. We also stayed in Higashiyama, which is filled with charming wooden buildings and picturesque streets. It’s also next to Gion, the famous geisha district and home to the Yasaka Shrine, which we strolled through on our first night. It’s not guaranteed that you’ll see any geisha, but we did see a few throughout our trip. We didn’t take photos as this is frowned upon in the city. We did, however, take photos of the many Japanese tourists who come to Kyoto on a historical pilgrimage and dress up in traditional costumes for the day. There are lot of shops offering this service, and as such a lot of colourfully-dressed people, around the Kiyomizu-dera temple. If you’re keen to see geisha, it’d be worth doing this guided night walk of Gion as the guide is more likely to know where to spot them. Another good spot in Kyoto was the Nishiki Market – it’d be fun to combine a trip there with a cooking lesson like this one. Although we loved Kyoto, we were surprised by how seedy it sometimes felt at night. At around 7pm in Gion, hostesses fill the streets, making their way to hostess bars. This was a recurring element of our time in Japan; although futuristic in many senses, its attitude towards women – from the culture of hostess bars to the maid cafes in Tokyo, and the tendency to infantilise women –often felt uncomfortable and difficult to comprehend. One thing we wished we could have seen in Kyoto bit didn’t have time to visit is the bamboo forest. Next time! 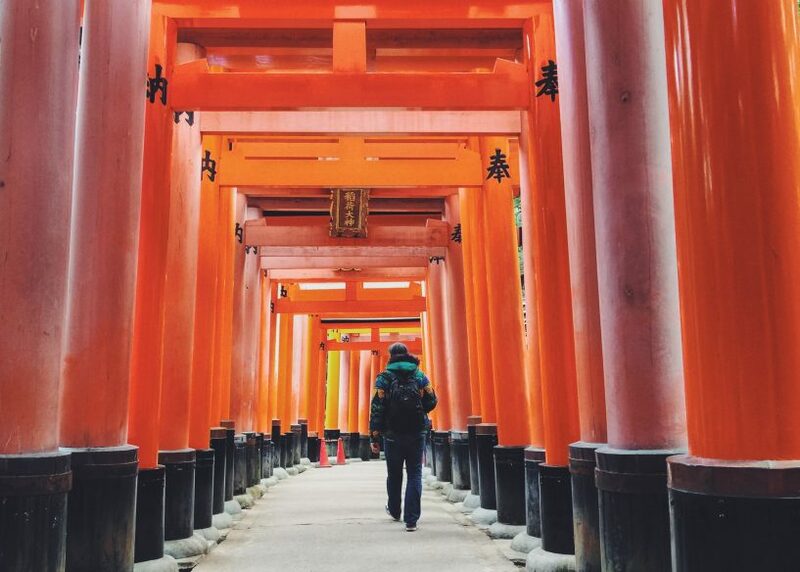 Here are some recommended tours in Kyoto, which might help you to see more in a short time and go deeper into the culture. We stayed in a studio apartment in Kyoto that we found through Booking.com. It was inside a building filled with apartments set up for business travellers with a small kitchen, washing machine and bathroom. It wasn’t anything special, but it was clean, well located and reasonably priced for Kyoto. As with our apartment in Tokyo, we were simply given a code to enter and didn’t meet the owners at all. We were also given a mobile wi-fi device. A studio apartment costs around 11,000 Yen per night (£66). Use this discount code to get £20 off your first booking. Kyoto is famous for its kaiseki-ryori cusine, which is unfortunately not vegetarian-friendly. However, you can also find lots of shojin-ryori food, which is traditional Buddhist temple food and entirely vegetarian. Because we’d already tried some in Tokyo and would be eating more in Koyasan, we didn’t try any in Kyoto, but we heard good things about Shigetsu, which is in the Tenruji temple in the Arashiyama neighbourhood (also home to the bamboo forest). Places we can recommend in Kyoto include: おかるcurry in Gion; deserts at Nana’s Green Tea; and the street food snacks around Fushimi Inari Shrine. 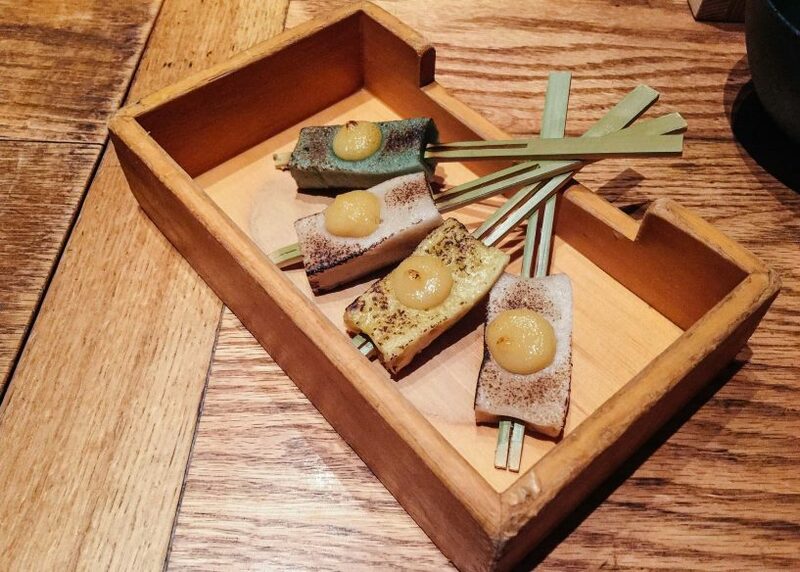 There was a vegetarian modern izakaya called Onikai that we would have loved to try, but it was fully booked during our stay. We also ate at a tiny little vegetarian restaurant called Hale in the Nishiki Market, which was atmospheric and cosy but the tofu-skin dish was a little slimy for our taste. The menu changes daily so I’d still recommend going there. We also ate good pizza one night at Pizza Salvatore, which was a nice little break from all the Japanese food. We found an amazing, cosy cocktail bar in Kyoto called The Sodoh, which is next to a fancy Italian restaurant of the same name. It was a great place to try some Japanese whiskey and they made an excellent Old Fashioned. It was our perfect type of bar – intimate, quiet and serving amazing drinks. 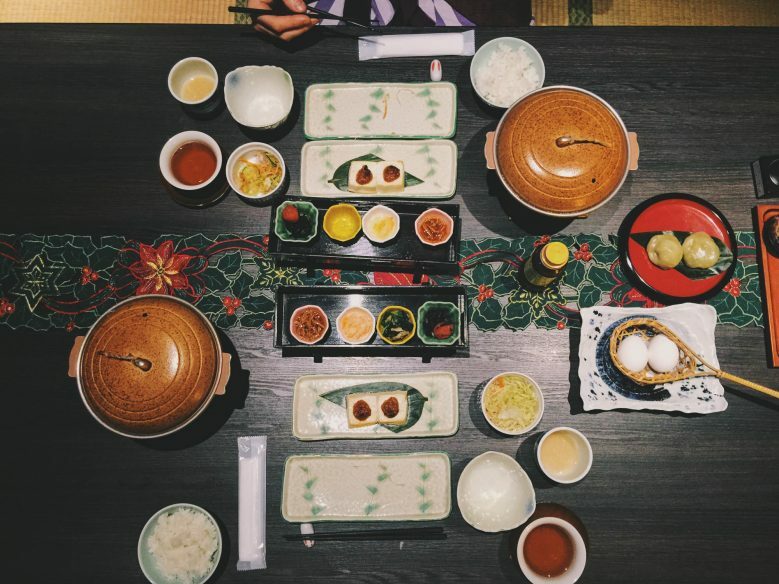 Simon and Erin at Never Ending Voyage have a good guide to vegetarian restaurants in Kyoto. 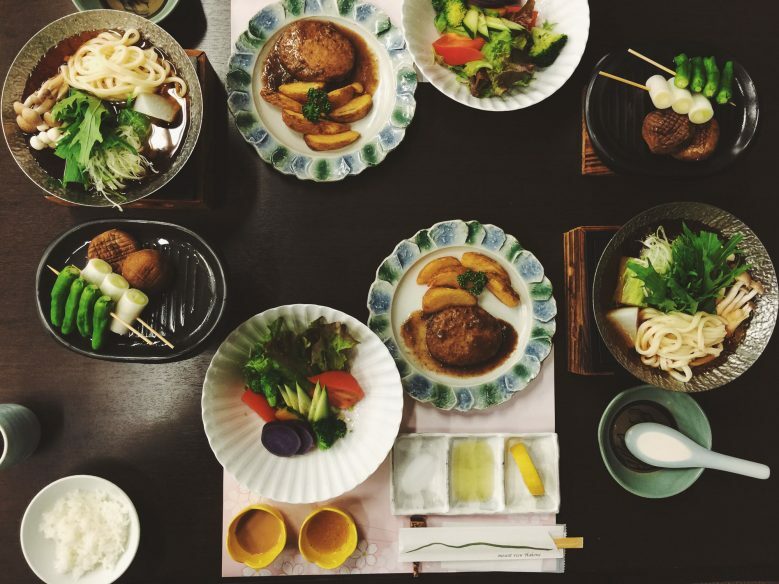 Kyoto also has some good food tours and cooking classes, including: an evening food tour in Gion; a Nishiki market tour and lunch; how to make ramen from scratch; and a Japanese bento cooking class. We got to Kyoto from Shibu Onsen by following the same route back to Nagano and then getting a train from there to Kanazawa (90 minutes) and another train from there to Kyoto (130 minutes). A train directly from Tokyo to Kyoto takes 140 minutes. Once in Kyoto, our JR pass worked on some trains, but for the two subway lines – Tozai and Karasuma – you need a different ticket. If you buy a ticket for one, it can’t be used on the other, unless you buy a day pass. The bus network is also good and useful forgetting to places such as the Kinkaku-ji Temple. Passes for both the bus and subway cost ¥1,200 for one day and ¥2,000 for two days. Nara and Kyosan were another two stops on our trip to Japan that required a bit of effort and planning to get to, but they were at the top of our list of “must sees” so we managed to fit them into our Japan itinerary. Nara was Japan’s first capital and is home to lots of temples and a UNESCO World Heritage Site. 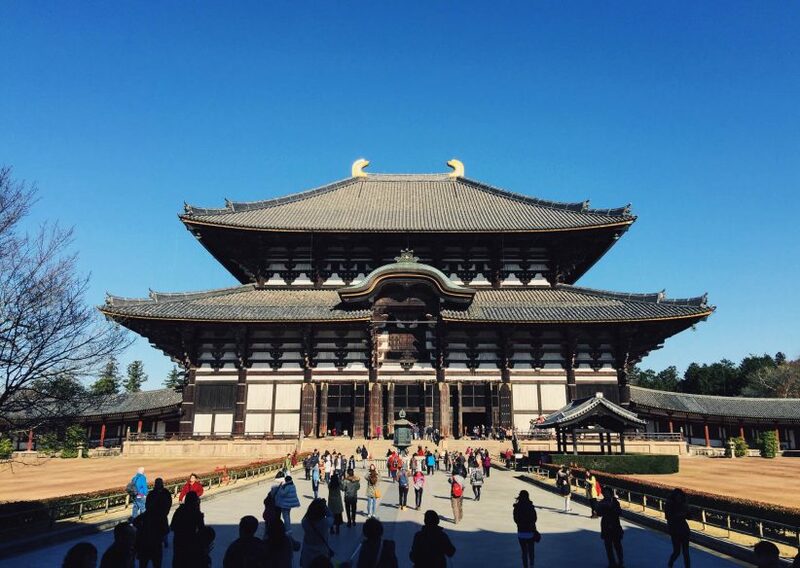 We had our eyes set on one temple in particular – Tōdai-ji, which houses Daibutsu, a giant statue of Buddha. Because we were short on time, we only stopped in Nara for a couple of hours en route to Kōya-san and headed straight to Tōdai-ji. The temple is in a beautiful park filled with tame deer, which unfortunately seem to have become reliant on the tourists for food. You could also try this walking tour of Nara, which gives a great overview of the city, including street food, temples and machiya houses. From Nara, we made our way to Kōya-san, the centre of Shingon Buddhism. It’s a small town situated on the sacred Mount Koya and is filled with more than 100 temples, many of which offer lodging for the night. It’s a magical place to spend some time in the company of monks while exploring the sacred sites. A highlight is the atmospheric graveyard, situated in a huge forest lit by lanterns. The graveyard also houses Oku-no-in, the mausoleum of Kukai who started Shingon Buddhism. 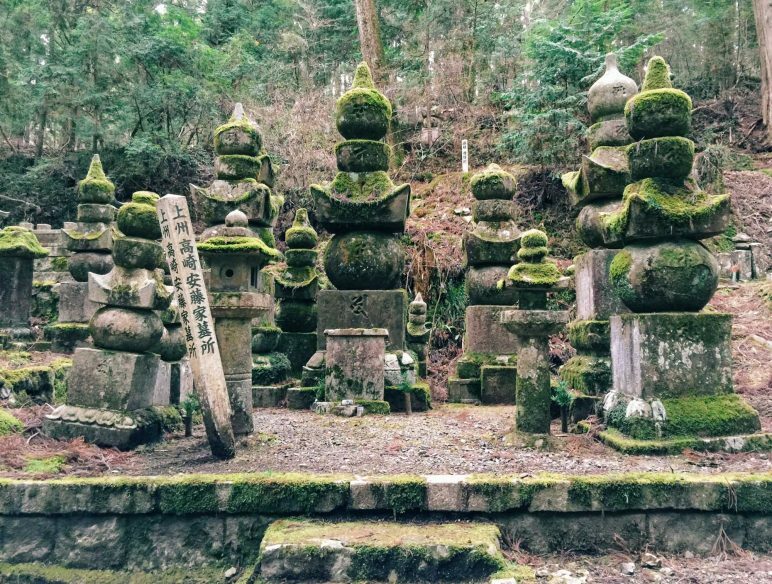 We arrived in Kōya-san in the late afternoon and left at midday so didn’t have a huge amount of time to explore, but we loved soaking in the atmosphere, walking through the cemetery, and seeing some of the temples, including Garan, the town’s central temple complex. We stayed in Shojoshin-In temple which was a beautiful experience, getting an insight into the life of the Buddhist monks. The temples in Kōya-san vary in quality and Shojoshin-In was one of the most beautiful we saw. As such, it was a little more pricey than some of the others, but for us, it was worth it. The temple is also right next to the cemetery, which is convenient for an evening walk. Our room was clean, warm and comfortbale with a balcony looking onto the mountain. Dinner and breakfast was included and everything was vegetarian as the temples only serve shojin-ryori (Buddhist vegetarian) food. A highlight was the early-morning service where we woke up around 5:30am to listen to the monks chanting. In Kōya-san Kōya-san we ate at our temple lodging (detailed above), and in Nara we grabbed a quick snack at the Mos Burger in the train station, which luckily, and surprisingly, had a veggie option. There are trains to Nara from Kyoto that take round an hour. To get to Tōdai-ji from the station, we took a taxi as we were short on time, but there are also regular buses. We knew we would be passing back through Nara on our way back from Kōya-san so we left most of our luggage in the train station lockers so we wouldn’t have to carry so much to Kōya-san (we bought a lot of stuff in Japan!). We got a train from Nara to Hashimoto (90 minutes) and a train from there to Gokurakubashi, which is a beautiful scenic journey through the mountain valley. From there, you get a little funicular train up to Kōya-san, which is also a lovely ride up the side of the mountain. There are three bus networks in the town and you can pick up a map at the bus station at the top of the funicular. We got a bus straight to the temple we were staying at. If you just want to see Nara, you could also do that as a day-trip tour from Kyoto or Osaka, which is a nine-hour round trip. We were only in Osaka for an afternoon/evening so we didn’t get to see much of Japan’s third largest city, but it’s a worthwhile stop on a Japan itinerary. We mostly just did some last-minute shopping in the Umeda area. We were specifically looking for the pottery and the famed flavoured Kit Kats. Unfortunately the shop that used to sell all the flavours in Namba station no longer stocks Kit Kats so it was a bit of a wild goose chase. In the end, we just got some multipacks in a local supermarket. We also went to the Namba area in the evening, which was bustling and neon-filled like Tokyo. We did one last night of karaoke there. 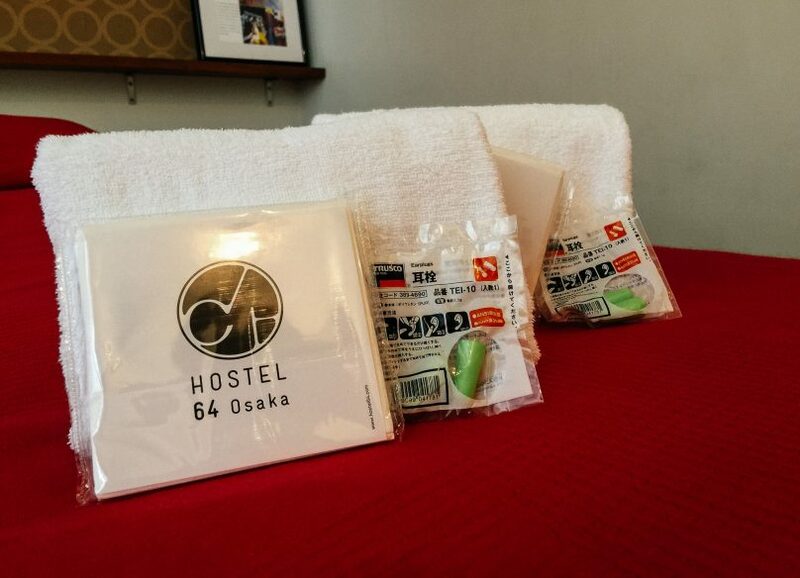 We stayed in a private room in a great retro-style hostel called Hostel 64 Osaka. The staff are really friendly and the hostel has put together useful guides to Osaka, including where to find the best food and shops. It was a five-minute walk from Shinsaibashi Station. We had curry for lunch at a little place called Camp, which was at the bottom of a department store in Umeda. For dinner, we tried to find an okonomiyaki, but it was served with fish flakes despite our protests (see vegetarian section above)! Let us know if you ever find a purely vegetarian one! 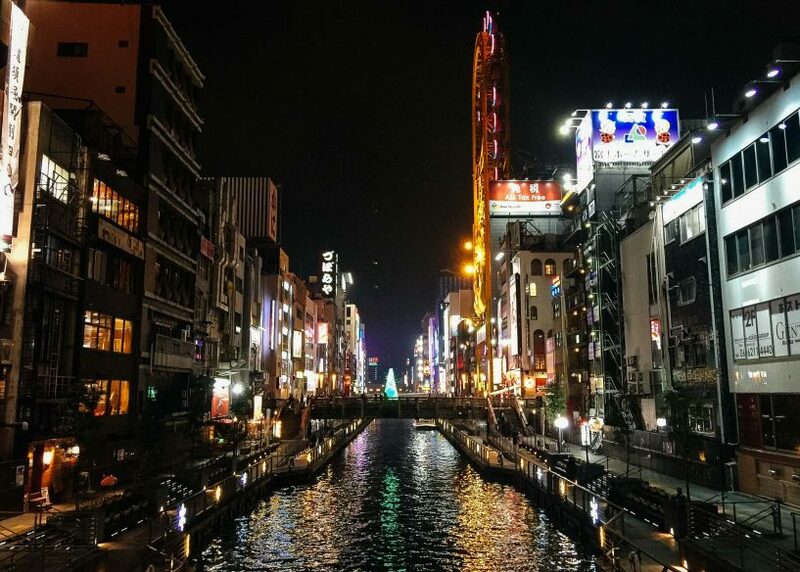 To go deeper into the food culture in Osaka, you could do this nighttime food walk or this street food hopping tour. From Koya-san, we took the same route back to Nara and got a train from there to Shinimamiya (37 minutes) and from there into Osaka (15 minutes). Osaka has a good subway system made up of eight lines. We were only there for a short amount of time so just bought single tickets for our journeys, but you can also buy an IC card like in Tokyo. We got to the airport via a train from Namba, which took about 35 minutes. The best way to save money travelling around Japan is to get a Japan Rail Pass. You can buy yours here. I’ve written another post with a guide to the most unique and best hotels in Japan. We booked our accommodation through AirBnB and Booking.com. If you sign up to AirBnB using this link, you’ll get £25 off your first booking. And you can use this discount code to get £20 off your first booking with Booking.com. We’ve also written a storybook version of this itinerary with lots more photos from the trip. Thank you! And it’s definitely a great one for the bucket list! My husband, daughter and I were about to book tickets to Korea and Japan for this April and cancelled as we felt we were planning our trip last minute, and things were becoming more stressful than fun. So we do hope to go to Japan sometime in the future and I will definitely follow this guide. Your 10 day itinerary is exactly what I needed. As Indians traveling anywhere can be quite expensive and more so if Japan is the destination of choice. I follow you on instagram so knew you had travelled to Japan and was waiting for this – so thank you for putting this together. Really enjoyed reading this! We’re actually in Japan at the moment, on a 23 day trip – we’ve been to some of the spots you’ve mentioned and makes me glad that we have that little bit of extra time! But you managed so well fitting everything in! Our next stops are Kyoto, Hakone and Tokyo so I enjoyed reading these and picked up some tips – thanks for sharing! Awesome, hope you had an amazing time! Great itinerary for 10 days in Japan! I love how you organize your itinerary by day and location, then accommodation, food, and transportation for each of them. Very informative with lots of details and easy to follow. We had a 9-day trip back in November 2015 and it was awesome. I composed a list of things to do in Japan and some travel tips as well. Wow, you really did fit a lot of things in in 10 days! Your post reminds me of our first trip to Japan in 2012 – when we hopped around the country (Tokyo (with a day trip to Lake Kawaguchiko, Nikko, Kyoto, Nara, Hiroshima, Miyajima, Osaka) in 10 days and nearly burnt ourselves out. But it really was a wonderful experience and made us fall head over heels in love with Japan. We returned for Christmas and New Year at the end of last year / beginning of this year and stayed for the entire 8 days in Tokyo. We decided we really wanted to get a feel for the city, as we had had such a sweeping visit the first time. We loved it even more than the first time and are already planning on going back next year again if we can. I am also vegetarian and found it can be a little tricky – you made me laugh about the fish flakes. I also had the same experience with fish flakes and dashi! However, I also found many restaurants would go out of their way to create something for me when they understood that I couldn’t eat meat or fish. I had some absolutely wonderful meals – and got a little hooked on Inari sushi! Amazing post and photo. Make me feel like wanting to go back Japan again! Thanks for sharing! Heading to Japan in October and finding this very useful to help plan our trip. Thank you! Really enjoyed this! Going to Japan next month and found this to be extremely helpful! So pleased to hear that. Have a great time! hy, do you think that is a good choise for november? Definitely! We were there in December so it’s pretty similar timing to when we went. Enjoy! Sorry to pop up here. Coz i have plan to visit this upcoming Dec. Well 29 Nov to 10 Dec.
was it very cold when you were there? Or how? Considering I am from Indonesia and it is warm all year long? Hi. How long before your trip did you book accommodation? Being winter when you visited was it busy? We booked about a month in advance for most of the places, but this was probably unnecessary. Most places seemed to have availability. have a great time! We just booked the same ryokan in Hakone! Did you find it hard to get to? Which station did you get off? Gora? or Sounzan? Did you take a bus or a cab from the station? Hello! It’s right next to the Little Prince Museum, which means it’s easy to find. We went by bus while doing the Hakone loop (we left most of our luggage in some lockers at the train station at Odawara so we didn’t have to carry much. )I believe we went from Gora. Enjoy your trip! Hi! Just chanced upon your itinerary, it’s a great resource for planning my trip especially your pointers for vegetarian food and the temple stay which I would really love to do! We are planning a 7-8 day trip, Tokyo, Kyoto, Nara were definitely on my list. I just added Hakone. Wondering if I can skip Osaka – would I be missing out on anything really cool? I’m interested in Universal etc as I’ve visited these theme parks several times in the US and would like to see places more unique to Japan. Are there any other places you had on your list of things to do/see but couldn’t make it during this trip? I think you can miss Osaka and not be missing out. The main reason we went there was because our flight home was from there. Universal would be awesome! We flew to South Korea first, so it was an open jaw ticket: London-Seoul and Osaka-London. Somehow that worked out to be a reasonable price. We flew with Finnair. You could also get an internal flight to save time? Have a great trip! Hi there! 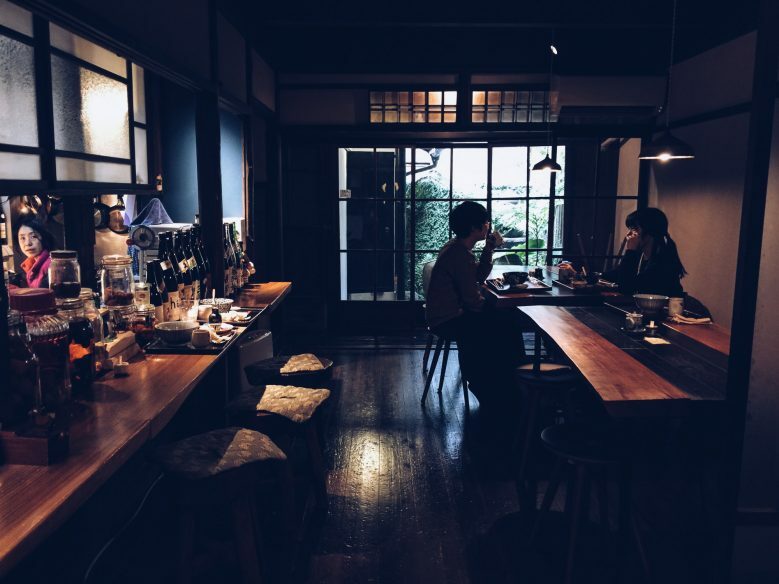 This is such a wonderful post and resource for my trip to Japan. Your pictures are beautiful. May I ask which camera did you use to snap these shots? Thank you! I was using an iPhone 6! Awesome post with great info dear! Thanks for sharing with everyone. I know you have already mentioned, but I recommend to go to the basement of the Department store. But my favorite places are Golden Pavillion, although beautiful and more. I loved it there. So much good food! I’m actually planning to be in Japan for 10 days and came across this – just amazing and so informative as I am a vegetarian myself and this definitely gave me some great places to visit. Thank you!!! Great! Enjoy it. The food is excellent! Hi, thanks for sharing your amazing experience, it will be very helpful for my next trip in 20 days!! Can you tell me how did you deal with internet, wifi etc..? Did you hired a device or you only used the free wifi hotspots? Most AirBnBs in Japan provide a little portable mi-fi device, which is super useful. Other than that, we just used wi-fi – there’s lots of it around. This is a wonderful travel plan. Highly recommended. I myself did 15 days backpacking trip across Japan in last April. Thanks! It’s so great isn’t it?! Loved reading your post and it’s really helpful as I’m planning a trip to Japan for 10 days next May. I’m also a bit sceptical about the maid cafes so glad to know I’m not the only one! I have a question for you – is it worth going to Hakone just for one night? The ryokans all seem very expensive in May so not sure I can afford 2 nights, but don’t want to waste my time either if one day isn’t enough. Yes, we thought one night was worth it. We just wish we’d left a little earlier in the morning as we missed the ropeway, which closes quite early. Make sure to leave Tokyo early in the morning and then you’ll have plenty of time. Enjoy! Really great write up on your blog. It will be a good guide for my trip with my Wife to Japan next Feb as it will be my 1st time there. Only thing I am confused is the JR lines in Japan.. Haha.. Thank you so much for all the details about your trip. I’m in the process of planning my trip to Japan and came across your post because I put in ‘Seoul’ in the subject line. I want to visit Seoul since I’ll be in the area and was hoping your itinerary mentioned how you got between Seoul and Japan? Can you share details about that? Did you start in Seoul? How did you get to Japan? Cost? Also, I may get the JR 7 day pass. I’m in Los Angeles and concerned with time it will take for it to arrive here? I saw it’s over nighted if you spend more than $600 but with 2 JR 7 day passes it’s not enough. Sorry for all the questions. If you could help answe any would be great! Hi Lind, So sorry I didn’t reply to this before. I missed it somehow. We flew from Seoul to Tokyo, and I’m afraid I don’t know how long it takes for the JR pass to reach the US! Hope you got it all sorted in the end! I really loved this read and was very happy to see that all my must-see destinations coincide with your recommendations! I’m going to Japan in March. What do you estimate was your total cost for transportation including the routes not covered by JR? Hi 🙂 I loved your blog on Japan. I’m headed there for Christmas in a few weeks with my partner. I was wondering if you happen to have the itinerary you took in a bulleted format? Hi, I’m afraid I don’t have a bulleted version of the itinerary. Sorry about that! Thank you for your wonderful blog. My daughter and i are planning to go to Japan next April. We plan to go for 10 days only. So this is ideal. We will spend a bit more time in Kyoto and not go to see the snow monkeys. Thanks Victoria for your post. Thank you so much for sharing this fantastic itinerary! My husband and I are traveling to Japan in two weeks… and we have been severely procrastinating the planning of our trip. This post totally saved our butts — thank you! ps. You’ve also got a new reader in me. What a lovely blog you have. Your writing is lovely and your photos are gorgeous — and your videos? Holy cow! Thanks again for all the work you do! Aw, thanks Kylie. That’s so nice to hear. Hope you had a great time! Hi! Loved your post!! Just wondering, why would we need a IC card if we already have the JR pass? We would be travelling in Osaka and Tokyo and many sites have all mentioned getting a IC card! Quite consfused as we will be travelling on the JR lines so we will only be using the pass anyway, right? 🙂 thanks in advance! Thanks for the wonderful details in your itinerary! The link you have attached to the agent you used for a discount on the rail pass links back to the regular Japan Rail website. Is this correct? I saw that the price wasn’t reflective of the discount you received. Can you confirm the website of the agentvuou used? Thanks! This was great! Question… how did you book the Shinjoshin-in temple place you stayed? You traveled to many places! Recently, Kanazawa is also on many people’s list as part of their Japan experience. If anyone has questions about Kanazawa, let me know – I’ll try my best to answer! I work for a walking tour in Kanazawa, so I know the place well! In all the travel that I’ve done, this has been one of the most difficult for me to plan. Perhaps its because of the ambitious schedule we have. We’ll be in Japan in February to support our family members running the Marathon in Tokyo. So, we decided to arrive in Tokyo a little early and then we booked a domestic flight to Osaka on the evening that we arrive in Japan. We’ve been trying to figure out the JR Pass thing, because we wanted to do day trips. We wont do overnights in any other places. Is this doable? Also, we want to use the JR Pass to travel back to Tokyo. The JR rail website said that we have to go to an agent. Thanks for the online link (I tend to get nervous about these agent sites – as I question their validity). So, we’ll be in Osaka for 5 days, and then in Tokyo for five days. This post has been a huge help for me. But, now I’m just wondering if we can do all of the things I’ve planned after reading your itinerary. Thanks for everything. Hi Cecily, I think it would be hard to do some of these things as day trips. If you want to do this exact itinerary, then I’d recommend doing some overnight stays. Have a great time! I know you did this trip a couple of years ago but do you recall roughly how much money did you spend overall? Would be good to have an understanding of how much to save up! I am planning to go next April with my daughter for 10 days or so. Eek, I’m afraid I’m really not sure. I’d have to look into that. You could get a good idea by adding up the Rail Pass plus all the accommodation then adding around £50 per day for food and activities. This is great and so helpful. We are just starting to figure out a trip to Japan this fall and this really gives us an awesome place to start. How did you pick the places you wanted to visit? Starting the research process can be so overwhelming. We are looking at about a 10 day trip as well, so are trying to figure out the “must see” places in just a relatively short period of time. Great write-ups and photos! It was difficult! But we had a few places we already really wanted to go to such as Koyosan and to see the snow monkeys so we built it partly around that. Hi there! Thanks so much for your post. I am also vegetarian. How highly would you recommend Mountain View Hakone? We are traveling first week of May where it is a lot more expensive. Also, how much did the private onsen cost? Thanks! Oh I really loved it there. The private onsen was great, and it costs 2,000 yen for 45 minutes. When you bought the prepaid card in Tokyo, did you get it at the airport? And when you use this, you don’t have to buy an actual ticket? You just hop on a train? Thank you! Yep, you just use the card in place of a ticket. We did get ours at the airport. Nice and informative post. Japan is a nice destination for travel. Thank you for sharing your itinerary (and amazing photos!) as this helped me plan our trip to Japan where we did so many of the things you mention here. I’ve decided to start a blog as well to share some of these adventures and insights with others. Topics discussed are how I’ve been eating sushi wrong all my life, Japanese obsession with toilets and exploring the Kit Kat store. Great blog. I love those toilets too! Great and very helpful post! Have you stayed in the shared bathroom room in Mount View Hakone hotel? If so, how was it? Thanks in advance! We had out own bathroom, so I’m afraid I can’t help you there. Very tricksy inserting the airbnb referral link three times!!! Didn’t mean to be tricksy – just useful! Anglophone women still take their husband’s last names upon marriage because women were legally considered chattel (property) of the male until as late as the early twentieth century. Hi Jenna, I’m sorry I offended you. I definitely wasn’t saying the western world is perfect in regards to women. Far from it. I think the whole world could do with more feminism! I also agree that feminism comes in many forms. I find that my own understanding and relationship to it evolves and changes all the time. For me, I find the objectification of women uncomfortable and that’s something that I see daily in England, and have seen all over the world. It always makes me uncomfortable, and in my short time in Japan, it felt quite pronounced, especially in the cities. I admit I don’t know enough; it was only an impression, and I will reflect on those words. Perhaps they were too flippant. I also want you to know I wasn’t judging the women who work as hostesses or in maid cafes. I know that many women do that out of choice. As you said, feminism has many different forms. And finally, I agree, it’s ridiculous that women are expected to take the man’s name in marriage. When Steve and I got married, we both changed our name to take both surnames, which we were much more comfortable with. So again, I’m sorry I offended you. I will reflect on those words, and edit them if needs be. Have a great time. Japan is surprisingly great for vegetarians! Hi Victoria, I very much enjoyed your blog. Please give some advice. We are going to arrive and depart from Tokyo, Aug 24th to Sept 3rd this year. We have 9 full days. What would you recommend? We are 60 and 65, so can’t do anything in a very fast pace. We love natures over cities. Thank you. Hi Amy, Sorry I didn’t get back to you in time to help with this. I missed the comment somehow. Hope you have a wonderful time. I’m sure whatever you decided will be great! Been looking for a lot of Japan travel blogs for the past few weeks and I would love to recommend your blogs to some of my friends since they will be travelling to Japan next month. Keep up the good work! Wow, you’ve got some really great photos here! Not to mention all the amazing details of your travels! 😛 But really, thanks for sharing this with me and everyone else. I think the idea of traveling to Japan can be really daunting for foreigners because–well, it’s SO foreign haha! I just went to Japan for the first time recently, and I fell in love with it, so I love trying to introduce others to everything it has to offer. Excellent. Thanks for the recommendation. Hi there, your write up is very informative and useful. I’m planning to travel to japan in Dec this year but worry the weather and your itinerarymight not work well together. 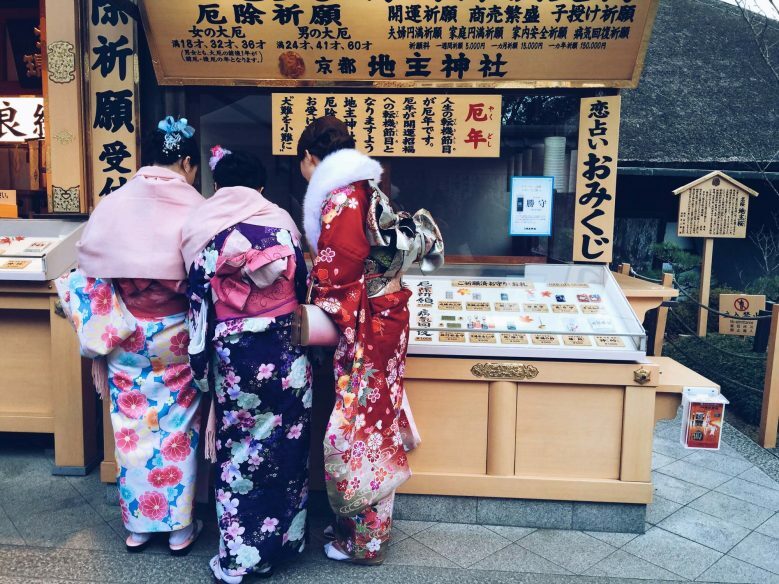 Just wondering which month of the year did you visit japan (this one your blogged about)? We were there in December too! My name is Michael. 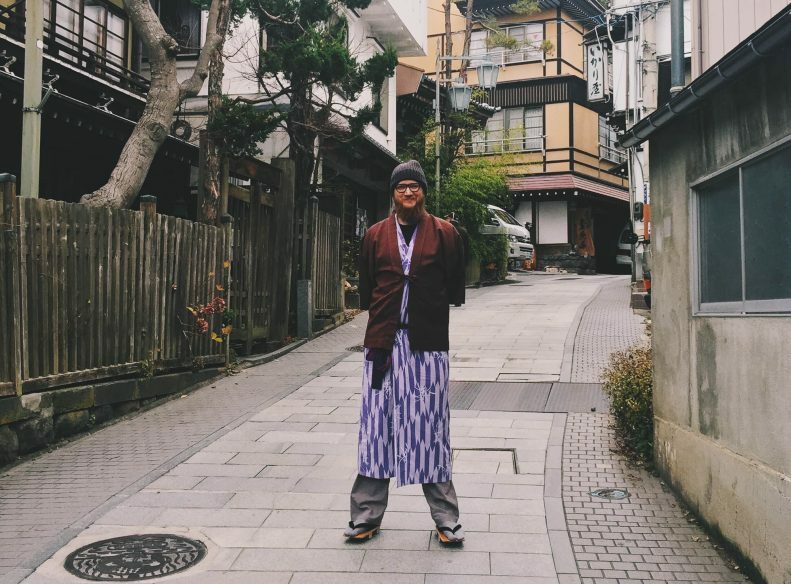 I love your blog about japan. Was already thinking about traveling there and visiting the country and having a look at there great culture. Would also like to know their medieval culture with all the Samurai. Thanks Michael. Have a great time! How much would you say the trip cost (not including flights) if you were to estimate? My girlfriend and I are traveling to Japan in late December, then continuing on to Vietnam and Cambodia. -Thank you for posting this! I’m afraid I don’t know how much it all cost (I should work that out at some point!). You’d get a good idea by adding up all the hotel costs, plus the rail pass and adding about £50 per day for activities/food. Sorry not to be more exact! Loved your write up. Am planning a trip and your article is really helpful. I am reading in many places that the (bullet) train to Kyoto has no space for luggage and hence one has to get the luggage couriered to Kyoto. Did you face a similar issue? If no, I’d like to know you did? If yes, how does one go about doing that? Get it done by the hotel? Hello, we didn’t have to do that. We just took our luggage on the train. I’m afraid I can’t remember how big the luggage racks were, but it was enough for our two wheely bags and backpacks. Great itinerary. Can you please let me know what month did you go. Sorry if I missed on your blog or on people’s comments. This is a wonderful itinerary. We have been to japan years go for two weeks and going back with friends who are first timers soon. It will be our first time to see the snow monkeys, interesting! My family visited Tokyo, Osaka and Kyoto a summer ago.Your right it was a trip I will not forget! We had the chance to see many of the sights you discussed. It is wise when planning an itinerary do so by neighborhoods.This ensures you get a lot of sights in. Be prepared to be exhausted every night. Thankfully we will return next year for my daughter’s semester abroad.I book marked this post to help set our itinerary. Thanks so much for sharing your experience! Hi Olaf, so pleased to be of help. Have a great time on your trip! Thank you so much for this detailed review. Your description and the accompanying pics are so helpful in planning our itinerary! We are arriving in Osaka Saturday late afternoon, departing from Narita Saturday morning, so we’ll have 6 full days in Japan. We are allocating the last 2 days for Tokyo since we’ve been there before. If you had to do your trip over again under these conditions, in hindsight how would have you planned it? What would be the must do things and must visit places? What could you skip? The Shibu Onsen sounds and looks so interesting but given our shorter stay and where we start and end, I don’t think we could spare the travel time to get there. Thanks for any tips! I think it really depends on your priorities. Koyasan and Shibu Onsen are the places that are most out-of-the-way, so perhaps choose to skip one of those? You could also do Hakone as a day trip rather than stay overnight. It’s really down to what you’d like to prioritise. I loved all of it! Have a wonderful time! Thanks! Pl asked you found it useful ? I’ll be travelling to Japan (landing at Narita Airport) in Oct 2018. It’ll be 9 day trip. Would like to know if there’re any English-speaking drivers or guide who can help us travel around Tokyo and Kyoto during this duration. Sorry I’m afraid I don’t have any knowledge about that. Have a great time! We can help you with that. We have a tour company based in Kanazawa, but which provides an executive service all over Japan, including English-speaking drivers and guides. Thank you for posting this itinerary! One question! I’m torn between Kyoto and Koyasan. Which one would you choose togo? This is my first time in Japan and I only have 7 full days. We are traveling to japan in november to celebrate my birthday! I felt so lucky to find your blog, omg I loved your guide! We are now including Hakone in our trip =) We are very excited to visit this place and are following your tips, so we plan to leave Tokyo very early and spend a night there. 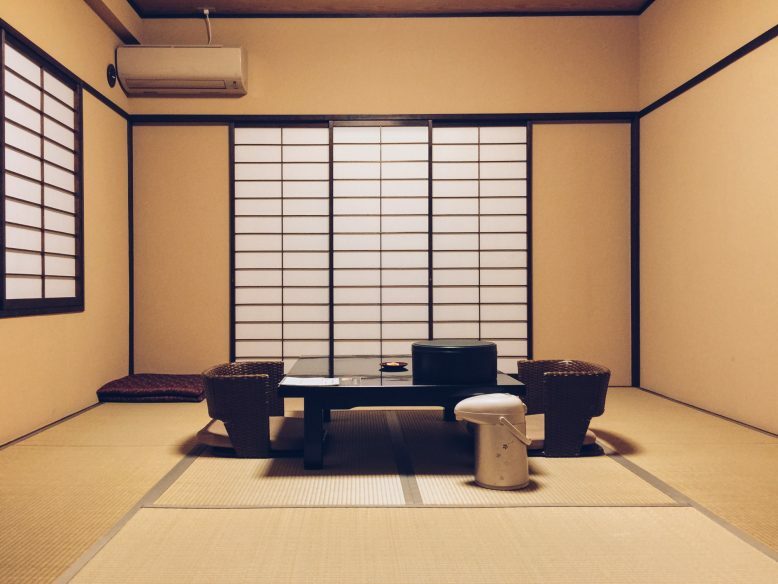 Staying at a Ryokan is something I always wanted/dreamed to do. Checking the availability in yours (and many others), I see the bathroom is shared. I wanted to ask you how easy or inconvenient is to share the bathroom in a Ryokan? If you could please share your experience (in case that you had to share) with us will be awesome! I appreciate it! Victoria, love your post. This is really on of the most extensive articles about travelling through Japan. If time is not so much of an issue, how long would you stay in Japan ? That’s impossible to answer! I like to slow travel, so maybe six months? Victoria, thank you so much for this wonderful post! Unfortunately I am already back from my wonderful vacation in Japan, but I will recommend this post to my friends who will go next month! Thank you! Hope you had a great time! This is certainly the best itinerary I’ve come across.. was so reader friendly and loved the detailing. Thankyou so much for sharing. All of it! It’s so photogenic! Japan a beautiful and peaceful country. Thanks for sharing all the great stuff. Just wondering which month of the year did you visit japan? We were there in early December. This is an extensive and informative guide to traveling in Japan! Thanks for this. Hey traveling with my 3 year old. Who doesn’t like walking much and we usually carry her stroller on trips. So wanted to check with you if it is practical for us to go see the snow monkeys? I’m afraid I can’t quite remember how accessible it is for pushchairs as we didn’t have Otis at the time. If it was icy, it might be quite difficult. Sorry not to be more useful! I was under the impression that Japan was also super expensive too. This post puts things into perspective. Also, have a few new places to check out. Thanks for sharing all of this great info! Thank you for this write up. May I ask if you have ever come across a list of discount codes for Japanese restaurants? Thank you so much for such a detailed trip report. Am using it as a base for our upcoming trip. I found the names of lodgings specially helpful as they are tried and tested places and saves one a lot of research . Hey, this is such a well-written travel blog about Japan. It brought back so many memories from my trip to Japan last year.